KONTAK DIE EIENAAR - MAAK NAVRAAG NOU OOR ID: 28747 - KLIK HIER ! 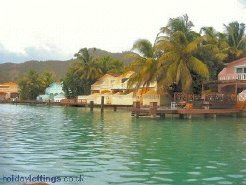 Aqua Vista is a beautiful 2 bedroom waterfront villa with private mooring for a boat. 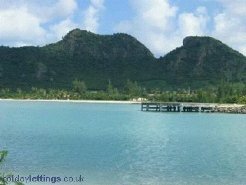 Just 1 minute walk away from a stunning secluded beach. Quiet and relaxing, yet only a short distance from the marina with fabulous restaurants and bars. Ideal for families with plenty to do. Why not try the new Zip Wire across the rain forest! 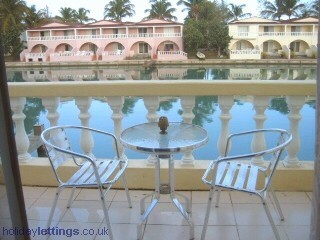 Or, sit and watch the sun set eating locally caught fish on one of the beach front restaurants. The villa benefits from a shared pool with shallow end perfect for children. If you want a romantic getaway, look not further, this villa is perfect. The island of Antigua is the largest of the British Leeward Islands. It is about 14 miles long and 11 miles wide. The temperature generally ranges from mid 70's in the winter to the mid 80's in the summer. Antigua boasts 365 beaches!! 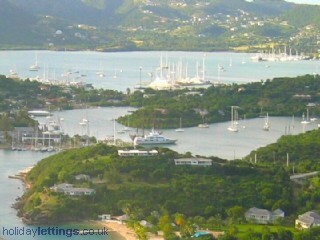 Lots of places of interest, why not try Nelsons Dockyard or English Harbour. Take a boat trip around the harbour. The new rain forest zip wire is great fun, zip across the trees and see breathtaking views of the forest. Dance the night away after watching a beautiful sun set at Shirly Heights. BBQ, rum punch, steel band and party! Swim the the Stinrays and learn how they live. Amazing sea life lessons. Snorkel around the reef on the un-inhabited Green Island. Private yatch charter can be arranged with local captain who can either give you a lesson or just lay back and enjoy the trip! Fly to VC Bird International Airport. 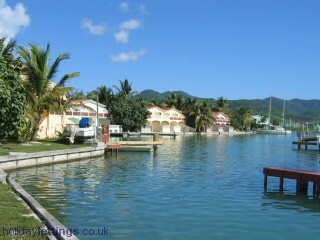 Jolly Harbour approx 20 mins away on the west side of the island. BA, BMI, Virgin, First Choice, Excel Airways all fly to Antigua. Private Taxi service pick up and drop off at airport in clean air-con 6 seater can be arranged. Car Hire is available at the airport and Jolly Harbour. Many many companies, including Hertz, and Avis. 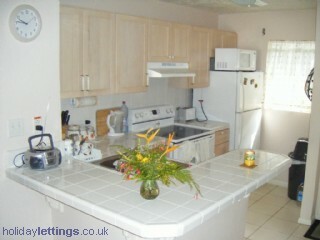 Open plan kitchen looking onto dining area, which leads to lounge area. Dining area seats 6. 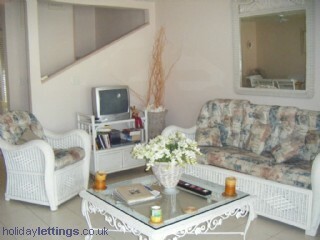 Lounge has large patio doors to terrace. 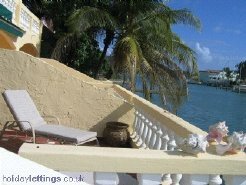 Large Italian tiled terrace with mooring for boat. 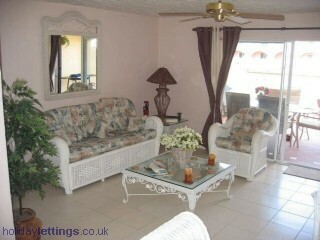 Table and chairs for 6 with 2 sun loungers. 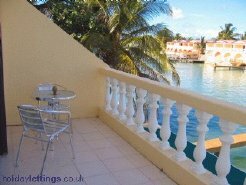 The master bedroom has a terrace overlooking the water with small table and chairs. 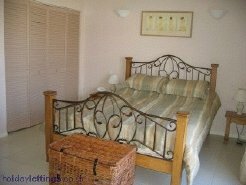 Both bedrooms have fully fitted wardrobes and en suite bathrooms. The lounge has Cable TV and DVD. Many DVD's films are left for your use. Jolly Harbour is approx 20 mins from the airport, when you enter it opens up to an oasis of coconut trees, palms and the most colourful flowers you can imagine. The backdrop being the azure waters of the Caribbean sea. Jolly Harbour is a secure complex which boasts fantastic facilities. Smaller children must be supervised at all times because of the terrace onto the water. Patio doors do lock onto terrace. 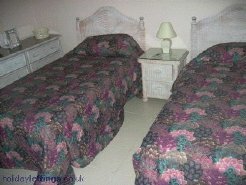 Linen and bath towels are provided and changed weekly. Check in and check out times flexible. 25% deposit will secure your holiday on booking. 'We had the best time! We will recommend to our friends' Mrs M Botton.